I mentioned a couple of months ago that now that my two girls are sharing a bedroom, I wanted to redecorate their room to have actual matching beds that actually matched the walls and window treatments. Silly, foolish, frivolous = I know. Trust me, I’m married to a man who sees no point in cute, especially if cute involves spending any money. So to keep BF happy, I’ve been trying to do this whole little re-do with an annoying little budget situation in mind but yet still not going all garage-sale chic. 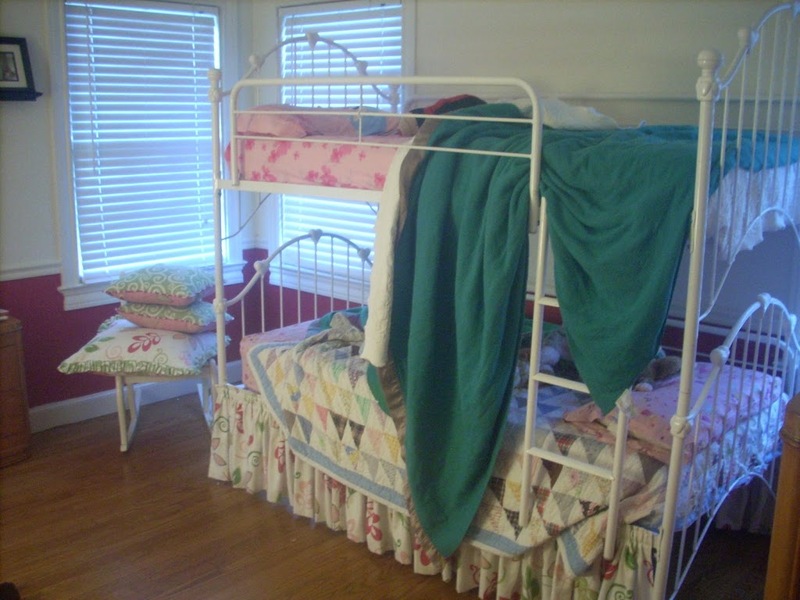 I started them in one room with mis-matched beds and bedding. 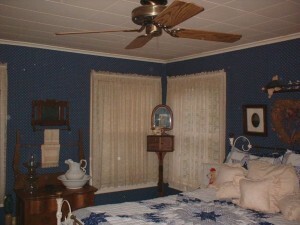 This was KB’s room, which was really cute until I moved Annie’s toddler bed in with its black-and-white toile bedding. I wanted to gouge my eyes out because of the ugliness of the combination of red walls, pink dust ruffles, and 172-year-old blankets that belonged to somebody’s grandmother. Plus I decided the bunk beds were an accident waiting to happen what with that ceiling fan in arms’ reach, PLUS impossible to make the bed every day for a 7-year-old. Bunk beds are from the devil, I tell you. I found matching twin quilts at Marshall’s, which were pink and green, took the beds apart, and moved them back to the pink room. 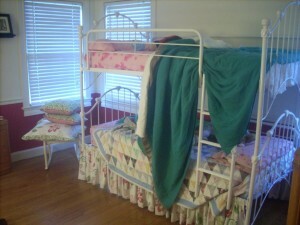 Which was already painted pink and matched the new quilts. BF looooved this whole process, by the way, as you can imagine. I aim to please…. So they’ve had matching twin beds in KB’s old room for the past few months. Fairly cute, I might add, and zero money spent. Win, win. But I couldn’t be content with that. No. The other room is bigger, by two whole feet. That’s significant. 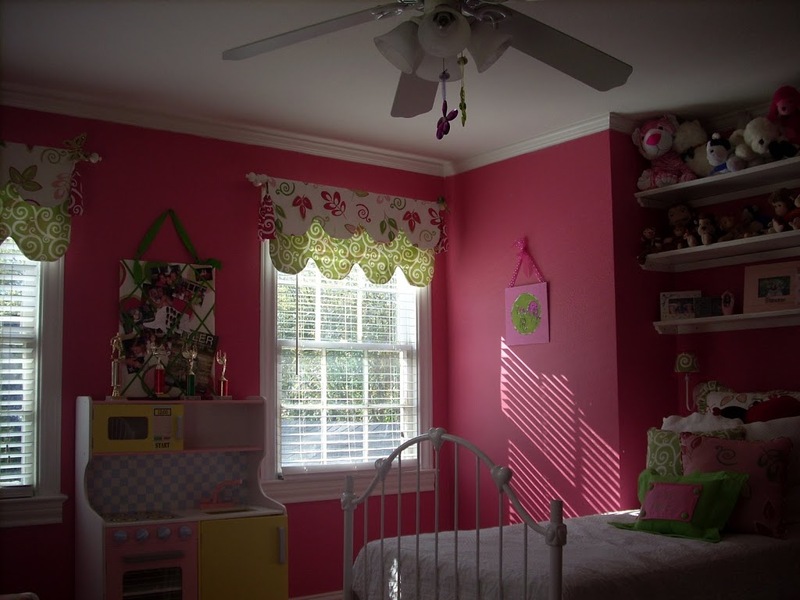 FURTHERMORE, KB’s old room has a blinding street light 4 feet from her window so its virtually daylight in there 24 hours a day causing certain three-year-olds to have a hard time going to sleep then waking up before 6 every morning. 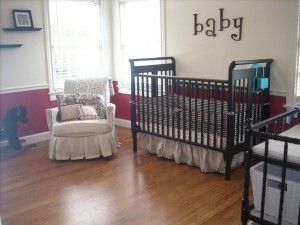 So I made the decision to move the twin beds back to the red room, Annie’s old nursery. I’ve been having blackout drapes made for the four windows in Annie’s old room. Have you ever had custom floor-to-ceiling blackout drapes made for four windows? My kids may not go to college since I have had to cash out their 529 account to pay for these suckers, but at least they’ll be able to sleep in a cute, DARK room. Past 6 am, if all goes according to plan. Drapes are as yet unfinished. I started painting the bedroom today. We’ve decided, for silly budgetary reasons , to keep the pink/green theme and work with the bedding we already had. Do you like that ‘we,’ as if someone else around here is helping with the decorating….? Its cute, but KB is quite crushed that we couldn’t have a little leopard print thrown in somewhere. She also asked for a king-sized poster bed like Crystal’s, some feathers on the lamps, and beads in the doorway. She probably won’t get all any of those items. Have I ever shown you what this room looked like before? Blue wallpaper. Ceiling tiles. Hideous fan. RED CARPET. Red carpet that smelled worse than a wet goat because it was damp and moldy underneath. Somewhere I have a picture of myself on my hands and knees, wearing a gas mask and gloves, tearing the old red carpet out of this room. 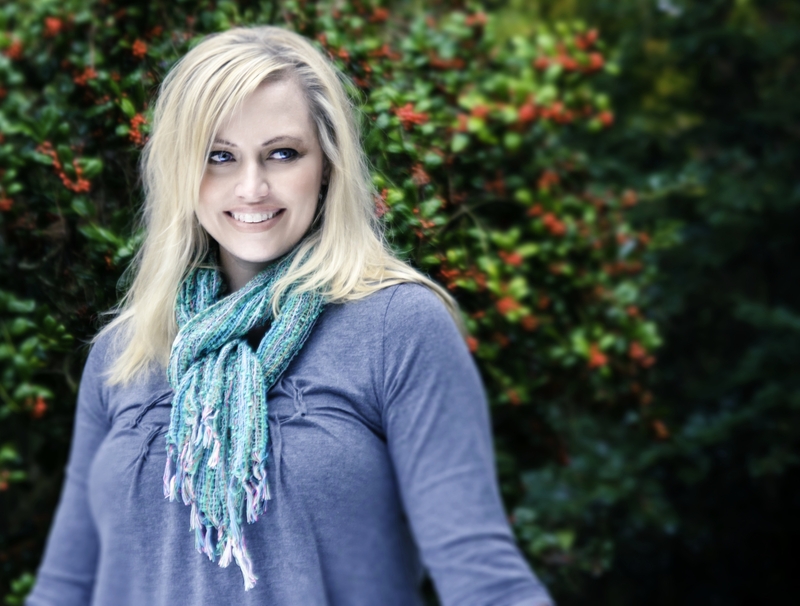 And on an unrelated note, in eleven years of marriage, BF has picked up the camera ONE TIME to take a picture of me. There is ONE PICTURE of me in this entire house post-1998-wedding, which OF COURSE had to be from that day I was on my hands and knees, pouring sweat, wearing raggedy clothes and a gas mask, gagging from the stench of the foul-smelling carpet. Though I’m glad to have one shred of photographic proof that I do actually live here with this family, there is a strong probability that picture will never make it into the blog. Tomorrow I’ll show you the stunning and fabulous paint job. Yeah! I love reading your decorating posts. i love redecorating, but it violates the instant gratification that my brain desires. why can&#39;t a room paint itself?